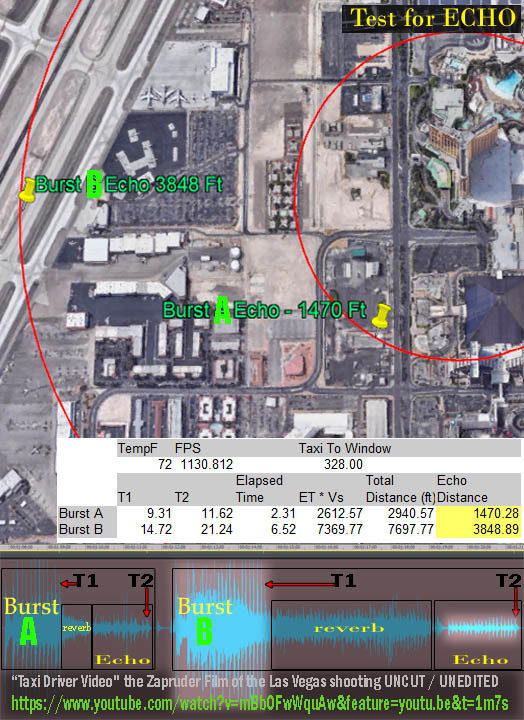 (INTELLIHUB)  Las Vegas Metropolitan Police Department audio captured during last Sundays active shooting at Mandalay Bay resort and casino reveals how officers confirmed that there were at least two shooters firing down onto the crowd of concertgoers attending the Route 91 music festival. After a series of fully-automatic gunfire popped off and people started getting struck by flying rounds a team of law enforcement officers and another element stormed the 32nd floor of the Mandalay Bay it was feared that there was an additional shooter on the 29th floor. Additionally, the audio recordings also reveal that a black Chevy dually pickup truck fled the parking lot during all of the commotions and that an older white male who was wearing fatigues and carrying a black bag was spotted retreating into a white RV by the Tropicana and the Motel 6. Pedestrians said that the man came from the area of the shooting. Pedestrians said that the man came from the area of the shooting and a team eventually converged on the white RV. At one point, a police car was commandeered by an unknown suspect while the two elements on the 32nd floor were cleared for 335 Zebras approach to the northernmost room.
] sniper going up, a voice called out over the radio. Thats when 720 called in an confirmed he had a 12 man element entering the east side of the Mandalay Bay. Its important to note that there may be a total media blackout and that other hotels may have been targeted. Yep. That's because the murderer moved to a different window. It could be. I hear two very different audible reports which indicate they came from different vantage points and perhaps came from different weapons. They do not tell me that one person did, or did not, fire both. You mean like a different window - One of the TWO only open/broken windows in the hotel? If there were two murderers, why wouldn't they both be firing at the same time? There's no audio that I've seen/heard so far that demonstrates two weapons being fired at the same time. The strobe... was still flashing at 5:02 AM the next morning, behind the reporte. Hundreds of feet from the flashing above entrance caught on video by the taxi driver, and about 25 floors up. The flashing in the taxi video is unrelated to the 32nd floor or the East end of the building. How many open/broken windows are there? No, I mean stop the 18m video at #4 dead at 5m00s and describe what is in the picture. The taxi is moving at ground level, there is a guard rail there, there appears to be a support stanchion for a vehicle entranceway, and the flash came from right above the stanchion. With or without broken windows, the flashes are there. The distraction about the 32nd floor does not make them go away, or move them to the 32nd floor. They occur remarkably at the same time as a very loud gun burst. And then they are gone, and they do not keep going. I did not say the flashes came through a window at all. I can't see what is there. It is dark. There is no way of knowing if the video is authentic, but the flashes are there. Any specific reason why you seem so committed to the lone gunman theory? This one will start at 4m58s. What are the flashes right over the stanchion? I'm committed to the - "show me the evidence", theory. Looks like strobe in the room to me. How many broken windows are there - TWO. That would be fine, if we'd seen all, or even most of the evidence. Are you thinking we have? >>but the flashes are there. The cab driver video is pretty good evidence to start with. From what I've seen/heard: One murderer. I'd like to know more about his "gambling"/laundery activities. Admit it. -- At this point, you're jumping to conclusions. And we all need to know a hell of a lot more about everything this creep was doing in the past. How many stanchions are in the picture? What does two windows broken on the 32nd floor prove about near ground level? Lots more conclusions than available evidence will support. About all I know for sure is that two windows are broken on the 32nd floor, lots of weapons were there, and a dead body was there when they entered the room about an hour after shooting ended. There were lots of reports on the police radio of shots from other locations. There was at least one shooter. I have insufficient information to rule out more than one shooter. No. Directly over a stanchion as recorded at 5m00s in the taxi cell phone video. About all I know for sure is that two windows are broken on the 32nd floor, lots of weapons were there, and a dead body was there when they entered the room about an hour after shooting ended. That's the impression I got... You? I also have some problems with the unexplained narrative they are selling. 1. On the police radio, control was saying forget the wounded, we've got to get to and neutralize the shooter. They ran up to the 32nd floor and accessed the hallway a few feet from the room door. Then they took an hour to breach the door. 2. Paddock shot for 10 minutes. He had lots of rifles and lots and lots of ammo. And then he just stopped shooting. And then, at some time during the hour it took to breach the door, he shot himself. prove about near ground level? How many windows are broken near ground level? Your cited analysis dismissed with a vastly superior one. This one also very clearly shows the geography of where the broken windows were, and where the taxi was. It also shows something very interesting about the area from where the flashes were seen in the taxi video. A window did not have to be broken. There is a great big ledge. It's yuge. And nobody builds a ledge with no way to access it. Audio Analysis of Las Vegas Shooter - Doesn't add up. I want to be clear, I'm not convinced that there are multiple shooters. However, what I will say is that the audio evidence from ONE PARKING PLACE, doesn't really add up in my opinion. 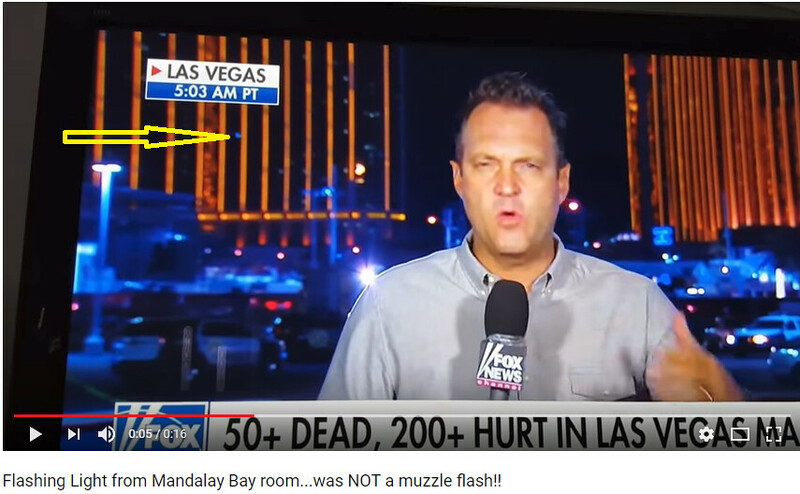 Indeed, since the taxi lady produced a video with flashing going on, videos have produced similar flashes, not in the same exact position, during the Big and Rich rendition of God Bless America, during a Fox News report [VxH #15], and up on the 32nd floor [VxH #15]. I have to wonder why so many strobes are flashing on Youtube videos in different places. The "muzzle flash"/strobe you reference at 5:00 continues flashing after the sound of gunfire stops. I have to wonder why so many strobes are flashing on Youtube videos in different places. Flashes without broken / open windows are just flashes. Maybe the fire alarm went off? I've worked in building that had strobes as part of the fire alarm. That audio has been misrepresented as proof of two shooters. I have provided a reasonable explanation why that interpretation is incorrect. If you have evidence to the contrary, share it. It means you have a vivid imagination or a third or fourth generation tape. And nobody reported hearing them and no fire trucks came. It surprises me that people are taking these various videos at face value. We know there are plenty of pranksters out there. We know that 4chan/Anonymous and some Reddit groups just love to prank the public. We have no way to know whether these are authentic and undoctored recordings. Interesting, but it should not be assumed the recording cell phone was positioned the same way while recording. The phone could have been held outside the car for the loud bursts and perhaps the windows rolled up with the phone inside for the subdued bursts. I don't know but a factor/possibility to keep in mind. Word salads with no evidence of gunshots are just boring. Here. I will show you the 32nd floor windows at the time of the bursts of firing. Don Lemon to the rescue. Show me the muzzle flashes on the 32nd floor. At about the 0m:40s mark, the bursts begin. While CNN concentrates on people running, try concentrating on the 32nd floor windows clearly in the picture. Try to find a muzzle flash from the 32nd floor. It is at that near end of the building. Where are they Mr. Fung? Interesting possibility, but I posted the 18 minute version of the video at #4 and it is one continuous shot. If the camera was moving all about, it should be noticeable. As she is driving a taxi during the bursts, it is more likely in a hands free holder. Everything about this investigation seems botched. The cops taking over an hour to break into the room seems botched. The sheriff in Vegas is a complete idiot. So I expect we'll have a lot of fake videos and CT mongering about this case. The principle of "generations" doesn't apply to reproduction of digital video super genius. When the alarm system is activated, horns will sound, flashers will be visible throughout the area and a series of emergency announcements will be played over the public address system. As indicated above, evacuation is not automatic." "There is a great big ledge. It's yuge. And nobody builds a ledge with no way to access it. " Hey - maybe Paddock was executed by a Klingon sniper from a cloaked bird of prey hovering outside his hotel room? 2. Paddock shot for 10 minutes. He had lots of rifles and lots and lots of ammo. And then he just stopped shooting. Now about that Klingon bird of prey - Were there any related flashes or spatial distortions visible in the cab driver video? The echo time differences would only indicate the shots were from different vantage points aimed in different directions. It would say nothing of the number of shooters, one or two. Actually it says quite a bit if you bother to examine what was actually recorded in audio where it *sounds like* two weapons are firing simultaneously. What's the difference between Reverb and Echo? It doesn't apply nearly as much but it is still there. Klingons would explain a lot. You should start your own YouBoob channel to share these insights with the world. "Used correctly, digital technology can eliminate generation loss." Comments (63 - 115) not displayed.